Marty Thacker and Team Hypermax made their return to the MBRP Diesel Drag Racing Series after taking the 2014 season off. 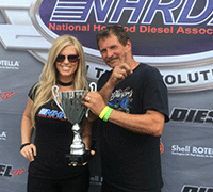 Thacker had two goals for this season, the first goal was to regain the National MPH and ET record that he lost to Jared Jones and the second was to win the Top Diesel National Championship. As we headed to the World Finals Marty was tied for points with Wade Moody but after his 2nd place finish at the World Finals he secured his 1st ever Top Diesel National Championship and we look forward to his quest to regain the National MPH and ET record in 2016.